Here some things we tried for Halloween this year. 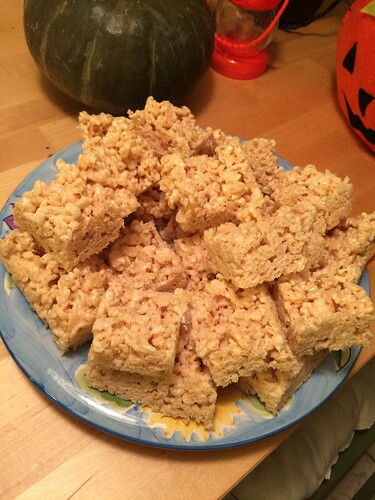 The first was brown butter rice crispies. These are made just like regular ones, only you brown the butter before you put the marshmallows in. Brown butter is made by heating and stirring butter longer than usual until it caramelizes and turns brown. You do want to keep stirring so it doesn’t burn. Next up, the peanut butter balls with m&ms or the sort mixed in. You could do chocolate chips too. I did cut the amount of sugar way way down since this called for a lot. Mix butter, peanut butter, M&M’s, and powdered sugar until well blended. More or less powdered sugar can be used to make mixture more or less dry. Make 1 inch balls and freeze for about 20 minutes or until firm. Microwave chocolate chips for 60 seconds, stopping every 15 seconds to check and stir. Tip: Adding some vegetable shortening can make the chocolate thinner and easier work with. 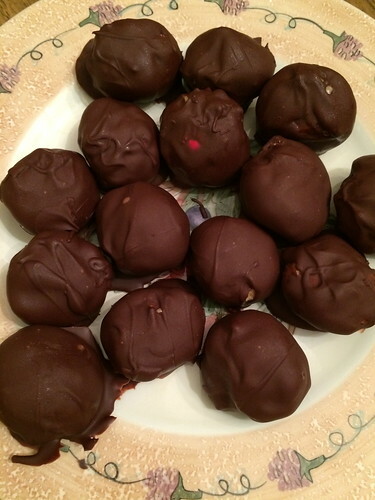 Remove balls from freezer and dip into the chocolate. Place on wax paper, top with M&M’s (optional) and allow to harden. Refrigerate if needed. If I’d had anything on hand, I would have decorated them prettier. Next time! I realized later I had chocolate sprinkles and should have used those. 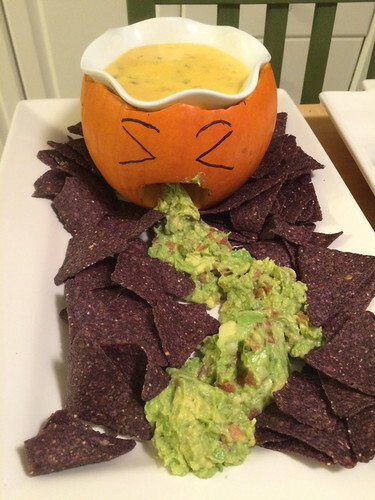 Next up, the vomiting pumpkin cheese dip and guac! Mash avocados with the lime juice. Add the rest of the ingredients and mix thoroughly. In a pot over medium heat, melt 1 Tbsp. butter and sauté scallions. Add cheese, milk and cornstarch, and mix until melted and smooth. Add green chiles and mix until combined. Draw eyes and carve a sad mouth on a small pumpkin. Hollow out the inside and insert a bowl. Pour queso in the bowl and top with chopped tomatoes. 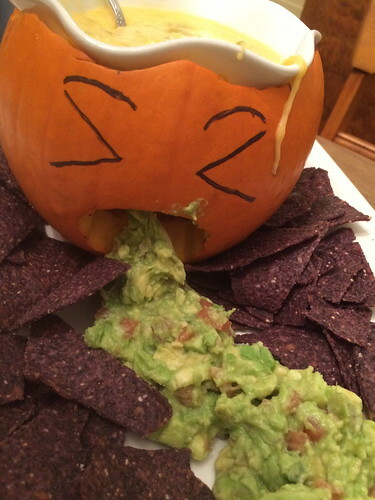 Spoon guacamole coming out of the pumpkin’s mouth. Serve with chips! 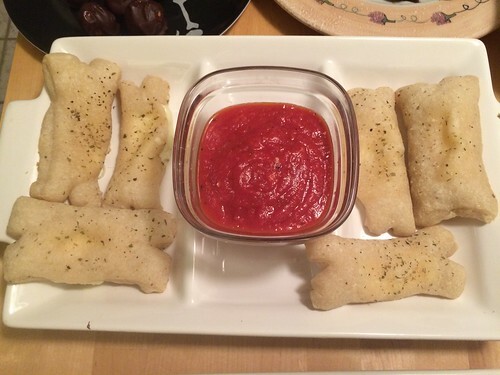 And then pizza bones! We liked the sauce, but I’d use different dough. The pizza dough was a little tough. Roll out the pizza dough and slice into 9 strips. Place 1 piece of mozzarella cheese towards the bottom of each strip, and fold the top over to meet the bottom. Seal the dough around the cheese by pressing the top and bottom together (make sure it’s SUPER sealed!). Cut a small slit in the top and bottom of each breadstick, and mold it into a bone shape. Brush with melted butter, sprinkle on Italian seasoning, and bake at 350°F/177°C for about 10 minutes. Heat oil in a deep skillet over medium heat, and add the minced garlic. Cook garlic for about 1 minute (don’t let it brown), then add the crushed tomatoes, salt, and red pepper flakes. Place 1 sprig of basil on top of the sauce mixture, and let it wilt while the mixture begins to boil. Once it’s at a boil, stir in the basil leaf, reduce the heat to a simmer, and cook for 10 minutes. Remove the basil leaf before serving, and top with some fresh basil. Mooohhhhahaha – Enjoy!